Personality: A nonchalant individual who doesn't care if he is a Genin or a Kage is the best way to describe Dangoon Hajime. Dangoon is a individual who cherishes his friendships and is always around for those who need his advice, even though he knows that almost nobody likes to take advice because of how silly he acts. Dangoon is known by the whole village as that one nonchalant lazy ninja with a big heart which is truthful to his character. Despite being a very kind man he knows how to fight if he has too. Dangoon is seen all around the village in places with shade so he can nap, he has a great respect for all his opponents even sometimes refusing to sneak up on enemies if they are just as honorable as he is. Eating Sweets: Dangoon loves sweets and is seen eating cakes pies or other sweets at Restaurant. Teamwork: Being a Genin as long as he has Dangoon knows how important Teamwork Truly is. Relaxing: Dangoon has always tried to find time to relax and usually does when nothing else needs to be done. Missing Nin: Dangoon simply cant understand why someone would betray their Home and Friends. Genjutsu: Illusions usually scary ones Dangoon always gets creeped out whenever he is put under one. Spiders: The Scariest of all bugs in his Opinion he tries as hard as he possibly can to avoid the little eight legged creatures. 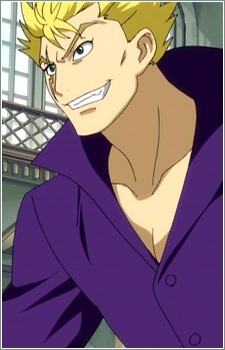 Appearance: Dangoon is a Muscular and slightly tall individual with spiky blonde hair metallic blue eyes and a white skin tone. Dangoon has a scar shaped like a lightning bolt over one of his eyes he wears a purple button up shirt black pants and black shoes. Bio: Born 19 years ago Dangoon Hajime was born from a Father who used to run a Lumber Mill and a Mother who still currently runs a Flower Shop. Dangoon from a young age knew he wanted to become a Shinobi because he didn't have interest in selling Flowers the rest of his life. When he came of age he joined the academy he usually slept through his classes but always barely managed to pass. Years passed without anything really interesting happening until the Genin Exams which Dangoon passed with relative ease. Dangoon's life as a Genin life was pretty uneventful taking on jobs that needed to be took, until the Chunin Exams came around he managed to barely scrape by with a mix of street smarts luck and ability but his two teammates fail. The Chunin exams were grueling he had barely gotten through the first part of the exams the second part being bad because he almost died several times one teammate lost an arm and the lost one of their eyes the third exam Dangoon got the snot beat out of him he had several ribs bruised a few cracked and 1 broken rib after the experience. A few years passed a few missions here and a few missions there and Dragoon was somehow allowed to enter the Jonin Exams In the Jonin exams he got beaten to near death but barely passed becoming a Jonin During his time as a Jonin he took on many dangerous missions almost like he was trying to get himself killed he goes solo missions a lot so nobody gets hurt by his own incompetence whenever he took a team into combat his main priority is to keep them safe before himself even taking a blade to the eyelid giving him his scar luckily his eye was undamaged . In current day Dangoon is currently living in a small one room apartment. RP Sample: [ Give a sample in character] Dangoon grunted as he laid is the grass he had just woken up he had actually been training he usually wouldn't but he needed to keep in shape. The young man had fallen asleep after training the night before. Dangoon sighed as he sat up he needed to go get something to eat. Dangoon then pushed himself up so he was standing he put his hand in his pockets he walked through town ignoring the people staring at him he was to lazy to care about it at just this moment he smiled a big goofy grin when he saw his old teammate but his teammate glared at him and walked away a slightly hurt expression appeared on his face. The blonde was about to follow him but was stopped by someone. "I wouldn't if I were you it's not really worth the trouble he still thinks it's your fault that he never mad Chunin and had to drop out of the ninja Program" another familiar face told Dragoon who eventually made Chunin. "Hmm is that so I really seemed to screw up that time huh?" the hurt look still on Dragoon usually extremely nonchalant face. The Chunin shook his head "I know you love helping everyone but he took the Chunin Exams 5 Times after that and failed it isn't your fault he wasn't cut out to be a Ninja he actually is doing much better in his current job as a merchant is happy and has an infant child" said the other man laying the exposition down on the Jonin. "You say that but-" Dragoon was then cut off by the Chunin "I forgive you are one of the most trustworthy people in the whole village" the Chunin said before disappearing very quickly himself. "Hmm oh well time to eat" his goofy nonchalant face returning to him as he walked off to get something to eat.